When we first came across California pedal makers Beetronics FX, we wanted one of its units before we’d even heard one, purely on the basis of how damn cool they look. Thanks to our friends at Face Distribution, you could have the amazingly cool looking and sounding Royal Jelly sat on your board by answering a simple question. Thankfully, there’s an awful lot more to the Royal Jelly than an undeniably cool case with 3D livery – this combined overdrive and fuzz pedal is made with a no-compromise approach to quality that means the insides look as eye-catchingly good as the casing. The Royal Jelly’s overdrive and fuzz circuits run in parallel, giving you the potential to create a massive array of dirty tones by blending them together using the ‘Queen’ and ‘King’ controls, both of which are footswitchable, meaning that you can have two blended sounds on tap, or have all fuzz on one, all overdrive on the other, and all stations in between. Needless to say, that’s a positively massive level of versatility! As if that wasn’t enough, however, there’s also a powerful EQ circuit that offers 10dB of cut and boost, you can blend your dry sound into the mix, and the Buzz switch is your instant ticket to the snarling high-end tonality and extra detail you’d associate with vintage fuzz pedals. 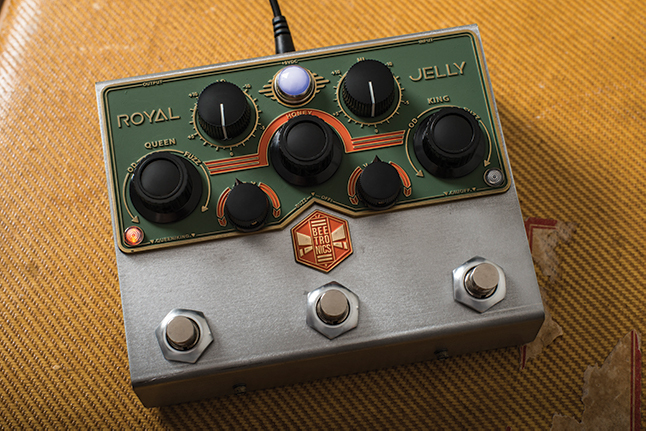 We reviewed the Royal Jelly in our November issue and were hugely impressed, noting that it was “absolutely full of sweet spots, with the pedal’s ability to blend your dry sound being perhaps the sweetest morsel of all”. To find out more about Beetronics FX, visit beetronicsfx.com, and to be in with a chance of winning one yourself, simply head to the link below and answer a simple question.